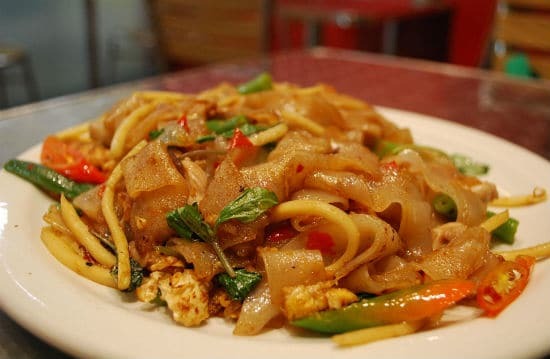 Pad Kee Mao (or Drunken Noodles or Pad Khi Mao) is a quick and easy spicy stir-fried noodles popular in Thailand. Though no alcohol is added to this dish, Khi means drunkard in Thai. 1. Cook the noodles as per packet instructions. 2. Strain and rinse until cold running water. 3. Drain well and keep aside. 4. Mix all the sauce ingredients in a bowl. 6. Stir-fry the garlic and green chillies for 30 to 60 seconds. 7. Add the minced chicken and stir well. 8. Cook until the chicken starts to change colour. 9. Add the capsicum, tomato, noodles and sauce. 10. Mix well and cook for a minute. 11. Add the basil leaves and stir to mix. 12. After a minute, remove and serve at once. Feel free to comment or share your thoughts on this Pad Kee Mao (Drunken Noodles) Recipe from Awesome Cuisine.